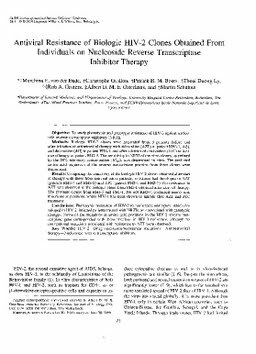 Objective: To study phenotypic and genotypic resistance of HIV-2 against nucleoside reverse transcriptase inhibitors (NRTI). Methods: Biologic HIV-2 clones were generated from 3 patients before and after initiation of antiretroviral therapy with zidovudine (AZT) in patient RH2-7, AZT and didanosine (ddI) in patient PH2-1, and after addition of lamivudine (3TC) to AZT monotherapy in patient RH2-5. The sensitivity to NRTI of the virus clones, as defined by the 50% inhibitory concentration (IC50), was determined in vitro. The predicted amino acid sequences of the reverse transcriptase proteins from these clones were determined. Results: Comparing the sensitivity of the biologic HIV-2 clones obtained after start of therapy with those from antiviral naive patients, resistance had developed to AZT (patients RH2-7 and RH2-5) and 3TC (patient PH2-1 and RH2-5). No resistance to AZT was observed in the biologic clone from PH2-1 obtained after start of therapy. The resistant clones from RH2-5 and PH2-1, but not RH2-7, contained amino acid mutations at positions where HIV-1 has been shown to mutate after AZT and 3TC treatment. Conclusions: Phenotypic resistance of HIV-2 to nucleoside analogues, which developed in HIV-2-infected patients treated with NRTIs, was associated with genotypic changes. Some of the mutations at amino acid positions in the HIV-2 reverse transcriptase gene corresponded with those involved in HIV-1 resistance, although no conventional mutations associated with resistance to AZT were observed.